Lacquer Lockdown: CrowsToes, Fanservice Nails, Lights & A Gun - What?!? CrowsToes, Fanservice Nails, Lights & A Gun - What?!? I hope you aren't sizzling like sausages on this 105 weather day like I am today, but at least it's a good day for multi-tasking in the AC with of course you guessed it - polish! I recently discovered the delectable phenomenon of trigger finger mani's on Nailed IT's blog and knew that I had to recreate a similar look. Of course I wanted to do leopard, but I've had a lot of feline inspired nail art up lately. But what could be as delicious as a spotted compatriot of the night? Perhaps a finely feathered friend smothered in a decadent jelly sandwich? I also wanted something that was dark versus bright which led me to one Ianto Jones of Fanservice Nails and the following result. I want to say a few things quickly because there's a lot going on here. First, I've already raved about Essie's Poppy Razzi collection. It's sickening - nuff said. The polishes were calling (left to right): Fanservice Nails Ianto Jones, Essie's Lights, CrowsToes Thing. Second, Fan Service Nails. Holy crap ladies - I have struck indie paydirt on this company! When I first ordered one my polishes arrived damaged in transit - boo :( I sent along an email and the situation was rectified at lightening speed. This is my first time taking one of my FSN polishes for a cruise and I am so impressed! 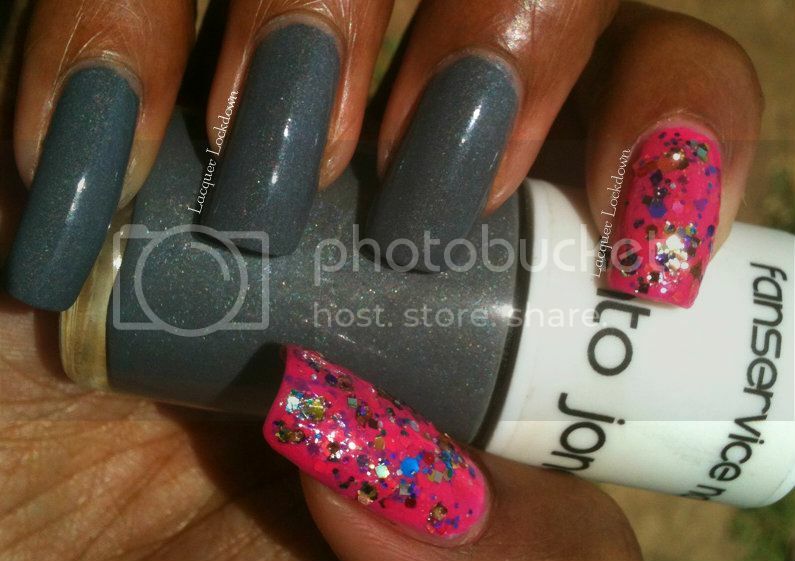 Ianto Jones is a glossy finish ONE COATER deep grey polish loaded with holographic microglitter. I just don't have words ladies - this polish is just so good I am in awe! Look at the holographic yumminess in Ianto Jones. 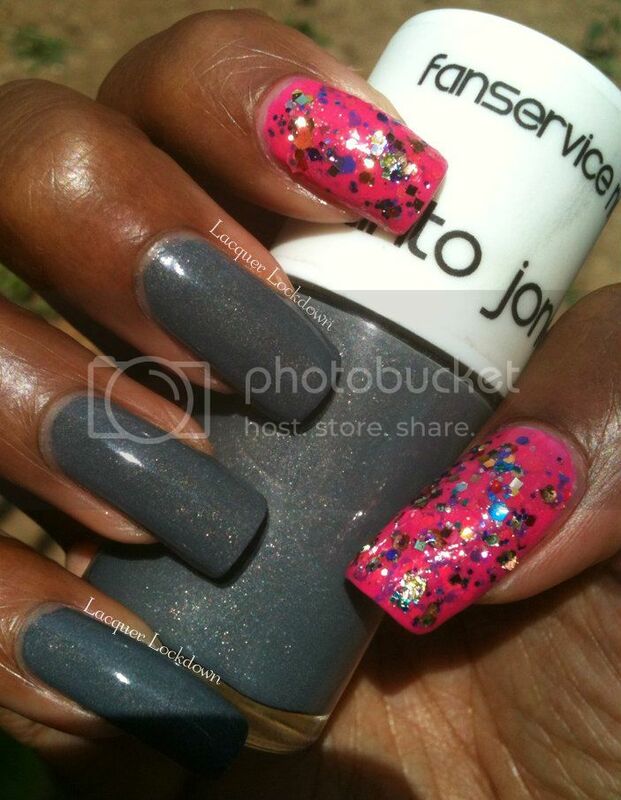 This polish is a rockstar especially when seen in direct sunlight! Third, CrowsToes. Please y'all know this biatch is fierce! I don't even have to say a word. Lauri is so talented every polish I have by her is gold and I have a lot (missing three to complete the collection). She is being stocked by both Kim at Overall Beauty and Leah Ann at Llarowe but she also has her own store over on BigCartel. Thing, is without a trace of irony, one of the prettiest things I've ever seen and a gorgeous glistening glitterbomb to boot. This is indirect sunlight. You can still see all of the holographic shimmer in Ianto but Thing also really pops into play even in the shade. Have you recovered from my polish gush yet? I have no self control, but in summation - yay for trigger accent mani's, jelly neons, and indie wonders! There are a lot of indie companies rocking my socks off right now, and I'm pretty pleased these days to have picked up some fine gems. And finally, I'm happy I get to share all my polish passion with you without feeling like a freak. Albeit, I readily admit my flag is always raised lol! Thanks for reading and see you next post! 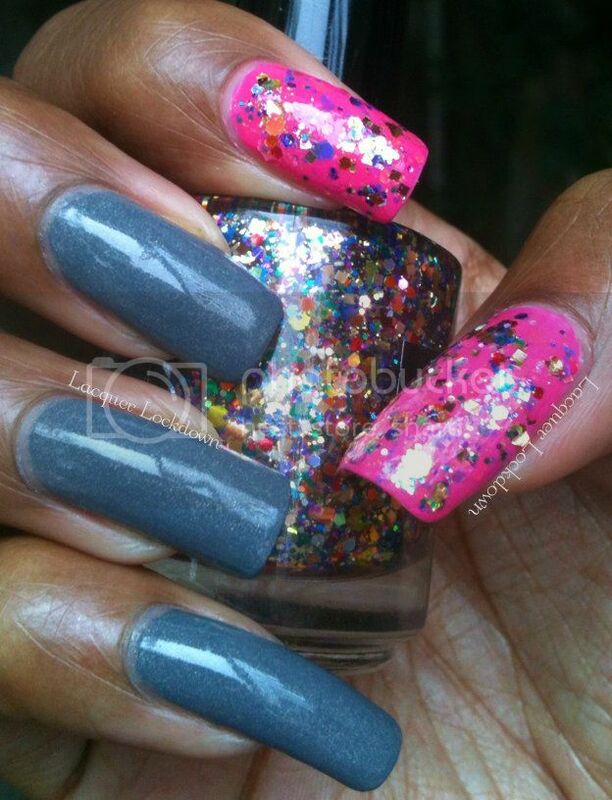 I really love that grey! It looks so great with the neon pink! !